Every so often I like to share books with my children that I remember reading during my childhood. 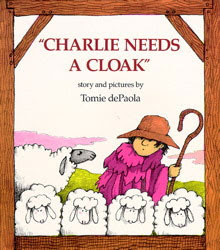 It took me awhile to rediscover the shepherd book, Charlie Needs A Cloak. I could picture the cover, but for some reason I couldn't recall the story and thought it pertained to the Biblical story of Joseph and his coat of many colors. Well, dePaola's book is about a coat or, rather, cloak, but it has absolutely nothing to do with the Bible! The book actually covers the process of making wool fabric. Isn't it funny how our memories fail us sometimes? "Charlie was a shepherd. He had a cozy house, a big hat, a crook, and a flock of fat sheep. But everyone said, "Charlie needs a cloak." 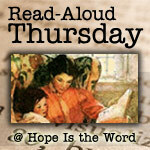 A hardworking shepherd named Charlie needs to replace his tattered, old red cloak. Beginning in the spring he shears his sheep and washes and cards the wool. Throughout the year, with the "help" of a particularly pesky sheep, he continues the process of making his cloak. He spins and dyes the yarn, weaves the yarn into cloth and sews the fabric. Finally, as winter sets in, Charlie is ready to tend his herd wearing his brand-new, beautiful red cloak. This dePaola classic is still in print for several reasons. First of all, it's hilarious! The reason Charlie's cloak is tattered is because his silly sheep keep chewing on it. One of his sheep isn't very happy about getting sheared and spends the rest of the story trying to take his wool back. Then there's an illustrated side story of a little mouse that steals various items and places them in a tree stump. My son so enjoys pointing out the funny mouse! Another reason that this book is a classic is because it has educational value. The process of turning wool into cloth is one that most children probably don't understand. While the hand techniques Charlie uses aren't practiced much anymore, the book still provides a very interesting historical overview of the process and introduces children to terms such as shear and card. If your kids are like mine, they'll want to read it over and over again. In the story, Charlie uses pokeweed berries (a.k.a. inkberry) to dye the wool yarn. As far as I know, we don't have any pokeweed plants nearby, plus all parts of the pokeweed plant are poisonous, making them a poor choice for a children's dyeing project. Because we wanted to match the books and dye our cloth red, we instead decided to try using cranberries for our natural dye. 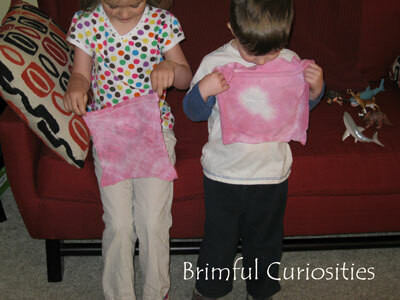 The kids used scraps of an old t-shirt and banded the fabric with rubber bands to make a tie-dye pattern. 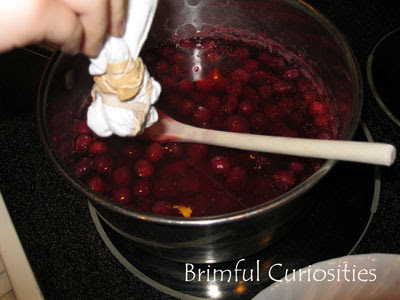 We boiled the cranberries in water and briefly submerged the banded cloth. 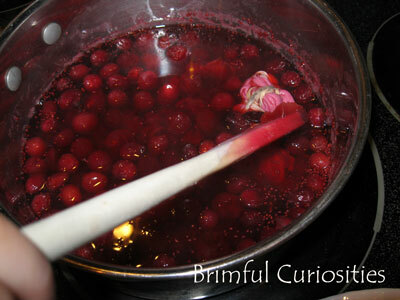 The cranberry dye makes a dark reddish-pink color. My daughter was disappointed the dye didn't make her cloth deep red like the color of the cranberries. Perhaps if we had let the cloth soak longer, the color would have been a little darker. I'm not sure how this dye would hold up to repeated laundering. Perhaps we'll have to try dyeing an actual t-shirt later this year using natural dye. If anyone has successfully dyed clothing with natural dye, please comment with any tips. We actually just found this book at Goodwill and read it so your timing is impeccable! What a great craft to now try out, thank you for sharing and thank you for the YouTube clip as well! that is pretty neat.. I think it would have been amazing if it was so red like the cranberries.. I can understand her being sad but it was still a nice color and great idea..
As a child I once stained a coat by filling my pockets with blackberries.. not a clever idea. But the stain certainly didn't come out. A blue-y grey. Mmmh. 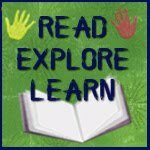 Thank you for linking to Kids Get Crafty! Much appreciated! I missed DePaola growing up (I'm sure I'm older than you ;-) ), and I still haven't read all of his (many!) books to my children. This one looks great, and my girls would love to try dyeing some fabric like this. Thanks for linking up! Oh, a Tomie dePaola book I haven't read. I enjoy his books and his illustrations. The tie-dyeing project looks like fun. I remember doing tie-dyed t-shirts at 6th grade camp, many years ago. You probably need a mordant, and heat to set the dye, otherwise it's a stain instead of a dye, and good laundry soap will probably remove it. Still, a lot of fun! Looks like a cool book! Wow! My daughter would love to do the dyeing project! Oh cute! I know they had fun! We love the Tomie dePaola books - they're so funny. What a cool idea...Love the tie dye!! I love this book. I used to read it when I had to teach economic terms to second graders. Words like producers, consumers, products, and goods went so well with it. Would soaking it in vinegar work to set the colour? That's what I do with brand new clothes to make sure they don't run. (I just add it to my washing machine). Live the tie dye..Great idea!! !